With the impending christening of the 114,500-ton 3,800-guest Costa Favolosa in Trieste next week, an event that is being tied in to the 150th Anniversary of Italian unification, it is worth having a look at the Costa Cruises Group. With its Aida and Iberocruceros branches in Spain and Germany it is now by far the largest cruise operator in Europe. We also take a look at why some people in Charleston have decided to sue Carnival Cruise Lines for basing a ship in their port. And the European Cruise Council confirmed last week that the European cruise market numbered 5.5 million in 2012, accounting for 30% of the global market. Figures released by Costa Crociere SpA of Genoa confirmed its position as Europe’s largest cruise operator, with 2.15 million passengers carried by its Costa, Aida and Iberocruceros brands last year. The overall passenger increase was 18% over 2009, with Costa group now operating twenty-six ships, fourteen under the Costa banner, eight with Aida and four with Iberocruceros, with another four for delivery by 2013, two each for Costa and Aida. The delivery and naming of the Costa Favolosa at Trieste on July 2 will bring Costa to fifteen ships and the Costa Group to twenty-seven. 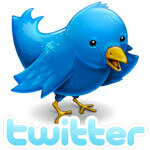 The group’s consolidated revenues rose by around 12% in financial year 2010, reaching just under 3 billion euros. Costa Crociere is now one of Italy’s top ten most profitable companies and ranks 49th in terms of revenues in a 2010 survey of more than 3,700 Italian businesses that generated revenue of at least 50 million euros the previous year. 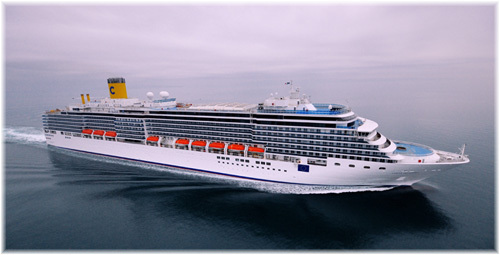 Costa has also recently announced its cruise itineraries for autumn 2011 and spring 2012. Its new programs will include new mini-cruises, for those who would like to try Costa for the first time, new and exclusive itineraries in the Caribbean, new routes for South America and a new extended cruise from South America to China. For those who would like to try Costa without going for a full week, in the spring and autumn of 2012 the Costa Atlantica will offer a series of new 3-4-5 night mini-cruises from Savona to Barcelona, Ibiza or Palma, Ajaccio and Marseille, with embarkations available at any of Savona, Barcelona or Marseille. On the other side of the Atlantic, the Costa Mediterranea will offer a brand-new Caribbean itinerary from December through March. A new 7-night cruise from Guadeloupe will alternate on two itineraries that include Aruba, Curacao, Costa’s private island (Catalina), Isla Margarita, St Lucia, St Maarten, Antigua, Dominica, Barbados and Antigua. Costa will also enhance its South America program when the Costa Victoria is based in Santos between December and March for 9-night cruises calling at Rio de Janeiro, Buenos Aires, Montevideo, Porto Belo and Ilhabela. The Costa Serena will also offer new Canaries and Madeira programs. From November through March, she will offer 11-night cruises from Savona to the Canaries and Madeira, as well as 14-night cruises to the Canaries and Madeira that will include calls in Spain and Morocco. Between November and March, the Costa Serena will also offer 11-night cruises to Greece, Turkey and Israel, leaving Savona and calling at Katakolon, Ashdod, Haifa, Izmir, Piraeus and Civitavecchia. 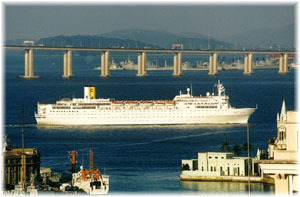 In a special sailing to position the Costa Victoria from South America to Asia, she will depart Santos on March 7, 2012, on an exclusive 72-night cruise to Shanghai, with four different sectors being offered to the public. The first leg, from Santos to Savona, will be a 17-night crossing with calls at Rio de Janeiro, Salvador de Bahia, Recife, Cape Verde, the Canary Islands, Madeira, Lisbon, Gibraltar and Barcelona. The second leg, leaving Savona on March 24, 2012, will depart for Dubai on an 18-night cruise calling at Naples, Port Said, the Suez Canal, Sharm el Sheik, Safaga, Aqaba, Salalah and Muscat. The third leg will commence on April 11, 2012, in Dubai on a 20-night cruise to Singapore that calling at Mumbai, Goa, Cochin, Malè, Colombo, Phuket and Port Kelang. And finally, the fourth leg to Shanghai will be a 17-night cruise with calls at Bangkok, Ho Chi Min City, Da Nang, Halong Bay, Hainan and Hong Kong. Thereafter, from May 18, the Costa Victoria will be based in Shanghai to offer a series of 4-5-6-7-night cruises for the growing Asian market. In the Indian Ocean, meanwhile, the Costa Allegra will again sail from Mauritius on 14-night Indian Ocean cruises from November to March, calling at the Seychelles, Madagascar and Reunion on a route offered only by Costa. 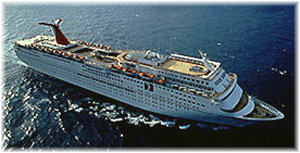 Starting in 2012, there will be a Costa ship positioned in the Red Sea year-round. From November to March, the Grand Voyager, be chartered from Spanish affiliate Iberocruceros, will offer 7-night Red Sea cruises with calls in Egypt, Israel and Jordan. Given characteristics that make her ideal for sailing the Red Sea, the ship will be operated by Costa Cruises with its own staff, and the service, atmosphere and style of a Costa cruise. Then from March until the end of 2012, Costa’s own Costa Marina will take over the 7-night Red Sea itinerary. In Europe, 8-night cruises on the Costa Magica out of Amsterdam will allow guests to visit six of Europe’s top capital cities on one cruise: Paris, London, Amsterdam, Berlin, Copenhagen, Edinburgh and Oslo. This cruise will also be available for boarding in Dover, which has been abandoned by MSC Cruises in favour of Southampton. Meanwhile, after returning from her first world cruise, the Costa Deliziosa will offer 11-night cruises to the North Cape and the Baltic, departing from Amsterdam. From Germany, the Costa Pacifica will offering a series of 10-to-16-night cruises from Kiel and Hamburg, to the North Cape, Iceland, Spitzbergen and the Baltic. The Costa Luminosa from Amsterdam and the Costa Fortuna from Copenhagen will complete Costa’s North European operations, with7-night summer cruises to the Norwegian fjords and the Baltic. Meanwhile, the new flagship, Costa Favolosa, will operate 7-night cruises in the United Arab Emirates and Oman throughout the winter of 2011 and 2012. In the Far East, the Costa Classica will leave Singapore on a 14-night itinerary, which can be broken down into two 7-night segments, sailing to Thailand and Malaysia. She will also operate 5-night cruises out of Hong Kong to Taiwan and Vietnam. Back in the Caribbean, in addition to the new program by the Costa Mediterranea, the Costa Atlantica will operate a new 10-night itinerary from Miami, with calls at Grand Turk, Ocho Rios, Grand Cayman, Roatan, Cozumel and Nassau. And for the first time the Costa Luminosa will be positioned in the Caribbean to run 7-night cruises from Guadeloupe, calling at a different island each day. Caribbean guests will also be able to enjoy the line’s private beach resort at Catalina in the Dominican Republic. In South America, there will be four Costa ships operating next winter: Costa Pacifica, making her South American debut, Costa Magica, Costa Fortuna and Costa Victoria. Cruises will be offered from Santos, Rio de Janeiro and Buenos Aires to ports in Brazil, Uruguay and Argentina. And looking further ahead, on January 6, 2013, the Costa Deliziosa will set sail from Savona on a 100-night Round-the-World cruise, a westbound route embracing all five continents. Her 2012 cruise, by comparison, will be only 76 nights. For the winter in the Mediterranean, the Costa Deliziosa will leave Savona in December on an 11-night cruise to the Canary Islands and three Mediterranean mini-cruises. The Costa Concordia will offer 7-night cruises from Savona to Marseilles, Barcelona, Palma, Tunis, Palermo and Civitavecchia. 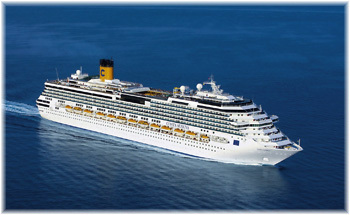 From February, the Costa Romantica will also be deployed on 11-night cruises to the Canary Islands. 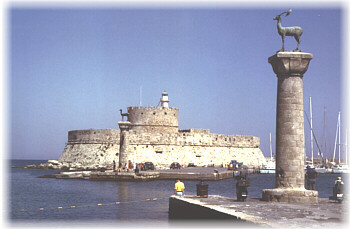 In the summer of 2012 the two new ships, Costa Fascinosa and Costa Favolosa, will sail from Venice and Bari on 7-night cruises to Greek Islands and to Greece and Turkey, The Costa Fortuna will also operate week-long cruises out of Venice and Bari, in her case to the Greek Islands and Croatia. The Costa Romantica will meanwhile leave Venice on 11-night cruises to Egypt and Israel or the Black Sea. And the Costa Classica will operate 7-night cruises from Trieste and Ancona to the Greek Isles. From Savona, the Costa Serena will offer a 7-night itinerary to Naples, Catania, Tunis, Barcelona and Marseille and Costa Concordia will offer a 7-night itinerary to Barcelona, Palma, Tunis, Palermo and Civitavecchia. The Costa Mediterranea, meanwhile, will offer 11-to-13-night cruises to the Canary Islands and to the Black Sea, or Egypt and Israel. Finally, from July to September, the Costa Atlantica will operate 7-night summer cruises from Savona to Civitavecchia, Naples, Tunis, Valencia and Marseilles. 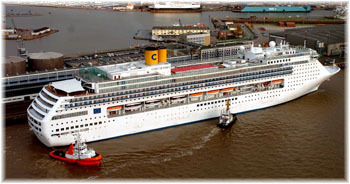 In the autumn of 2012, Costa Deliziosa will be deployed on 11-night cruises from Savona to the Canary Islands, Costa Luminosa on 9-night cruises to Lisbon and Casablanca; Costa Pacifica on 11-night cruises to Egypt, Greece, Israel and Turkey and Costa Fortuna 10-night cruises to Egypt, Greece and Turkey. During the autumn and spring the Costa Magica will also offer a special 10-night itinerary to Marseilles, Livorno, Palermo, Athens, Izmir, Rhodes and Malta. 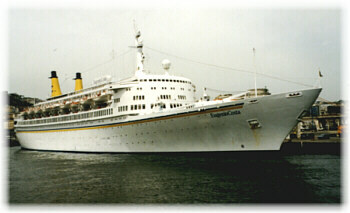 Thirty years ago, in 1981, after surpassing the Soviets with a mix of ten owned and chartered ships, Amerikanis, Carla C, Danae, Daphne, Enrico C, Eugenio C, Federico C, Flavia and World Renaissance, and the Costa Riviera about to come on line, Costa claimed to operate the world’s largest cruise fleet. Now, as the largest cruise operator in Europe, there is no doubt that, with fifteen ships to its name and twenty-seven under its control, Costa has come a long way, and has picked up a significant role in the development of cruising on a world scale. On May 23, we reported under the heading “Local Politics Become A Pain in Certain Cruise Ports” on recent events in Victoria BC, Charleston and Venice. We said specifically about Charleston that “with so many parties involved, it is difficult to see what the eventual outcome might be.” Last week, however, some of the elements in Charleston came together to take action in what could promise to be a lively debate. As we reported, since May 2010 the 2,056-passenger Carnival Fantasy has been operating about seventy cruises annually from Charleston. In the same time, the number of cruise ship calls has grown from thirty in 2009, to sixty-seven in 2010 and up to ninety scheduled for this year. And the city and the port authority have agreed to limit the number of cruise calls to two a week, and not to have more than one ship in port on any day. But when the Carnival Fantasy is in port turning around, two streets are closed off so that up to 2,000 passengers can be handled on and another 2,000 off. Filed by the Southern Environmental Law Center in the County Court Of Common Pleas, parties to the suit include the Coastal Conservation League, the Preservation Society of Charleston and the local Ansonborough and Charlestowne neighbourhood associations. Issues covered include the size of the ship, perceived violation of local zoning ordinances and pollution from emissions and discharges into local waters. As if there weren’t laws and regulations that governed such things, the group said the ship’s visits amounted to putting illegal hotel operations in places that were not zoned for them and even that Carnival’s trademark red, white and blue funnels contravened local sign ordinances. Previously, they had also complained about closed streets, increased traffic and soot annoyance. The suit wants a judge to block cruise operations that “constitute a nuisance” and declare illegal the installation of a cruise terminal at the port’s Union Pier. The City of Charleston, South Carolina Ports Authority, Charleston Metro Chamber of Commerce and International Longshoremen’s Union local have all promised to intervene in the suit on Carnival’s behalf. “We’re going to stop this kind of foolishness in our city,” said Mayor Joe Riley. For its part, The South Carolina Ports Authority issued a statement saying “We believe this suit is frivolous and is intended to harass Carnival in hopes they will leave Charleston rather than endure further public attacks by this element of Charleston’s population. We also believe that the suit will inevitably fail on its complete lack of merit. “Unfortunately, Carnival is being used to strike out at the South Carolina Ports Authority and the City of Charleston. Carnival not only complies with all applicable laws and regulations but, in many cases, exceeds those requirements. Meanwhile, the South Carolina House of Representatives passed a resolution last Tuesday thanking Carnival Cruise Lines for its economic contribution to the state while operating in an environmentally sensitive manner. The house recognized that cruise operations in the Port of Charleston in 2010 brought an estimated $37 million impact to the area, and that each Carnival ship was responsible for around $323,000 in local direct spending. The resolution further points to the fact that Carnival has voluntarily set strict environmental standards that exceed federal and international law. Figures issued by the European Cruise Council last Wednesday confirmed that 5.5 million Europeans took a cruise in 2010, a 10% rise on 2009 that now accounts for 30% of the global cruise market. The largest producers were the UK with 1.6 million, Germany with 1.2 million, Italy with around 890,000 and Spain with 645,000. The industry also grew in terms of numbers of passengers boarding in European ports, set at 5.2 million, a rise of 7.2% on 2009. The economic impact of this cruise activity was estimated by the ECC to have come to €35.2 billion, which included €14 billion of direct spending. Chief beneficiaries of this activity were Italy with €4.5 billion, the UK with €2.6 billion and Germany with €2.3 billion. These figures are made more interesting by the fact that the UK does not build cruise ships while the other two beneficiary countries do. Some 23 cruise ships will be built between 2011 and 2014, in an investment of close to €11 billion.